Fourteen days ago I got the flu from my husband. Seems the virus has invaded his workplace and many of his co-workers are sick too. Of course, instead of staying home and taking care of themselves, some of his co-workers continue to go to work and spread the flu to others! I know it was serious this year because my husband actually took sick time and stayed home. Unfortunately for me, it it pretty much impossible to avoid getting sick when you live with someone who has the flu. Yes, I did get a flu shot this year. Personally, I am thankful that I did, because here in California, this year's flu outbreak is serious. The flu has killed almost 200 people this year in my state and is hitting the 18 to 49 year old age group the hardest. In the past, I have debated over whether to get the flu shot or not. My reluctance stemmed from a flu shot I got back in 2007 which resulted in a massive migraine headache about an hour or so afterwards. Looking back, I think the real source of the headache was that the injection was made into a trigger point, which aggravated it and caused the headache. Now I ask the nurse to poke around first and select a site that isn't too painful. This strategy has prevented a repeat post-flu shot headache. Talk to your doctor about the pros and cons of getting a flu shot. Because if you have pre-existing medical conditions like me, getting the flu can be serious, even life-threatening. Even with the shot, you can still get the flu like I did this year. But I believe getting a flu shot this year prevented me from developing a more serious case of the flu and helped me avoid flu-related complications and hospitalization. This year, my hubby had a "light bulb" moment. "I should get the flu shot too, should I?" he said to me. "Yes, you should," I replied. While I am grateful he (finally) had this insight, secretly I just wanted to hit him over the head. The flu is contagious. That means it can be passed from person to person when the virus becomes airborne through coughs, sneezes and even just talking to someone. Plus if people touch their noses and mouths, they will transfer the virus to their hands -- and our hands touch almost everything around us. Once you get the flu, you can spread the infection for 5 to 7 days. So perhaps the best thing to do is convince those around you to get the flu shot too. It might be hard to convince them, but don't give up trying. Your family needs to know that the flu shot helps create a barrier around you that can keep you healthy. In the past, my hubby said, "I don't get the flu and I have never gotten a flu shot." Clearly that didn't happen this year...which has lead to his change of heart. 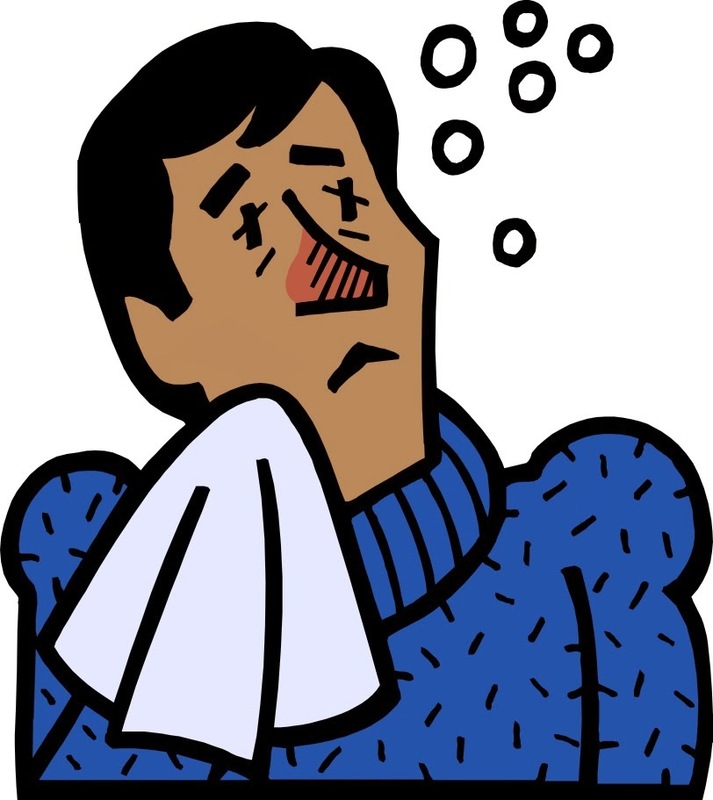 Things like hand washing, covering your cough or sneeze with a tissue and disinfecting surfaces can help prevent the spread of the flu. Using hand sanitizer when you are out and about might be helpful too. Training yourself not to touch your face with your hands, while hard to do, can prevent the virus from getting to where it likes to live. The problem is, getting the people you live with to be conscientious about doing these things too might be hard. And the alternative, spraying down every surface of your home with disinfectant on a daily basis, might not be practical, affordable or good for you. What would be most helpful is if people who were sick, especially those running a fever, would stay home and rest for a few days. When taken during the first 48 hours after you get the flu, antiviral medications can lessen symptoms and speed your recovery. But you also need to know what the flu symptoms are and be able to see your doctor right away to get a prescription. In the past, I have talked to my doctor at the start of flu season and gotten a prescription ahead of time, "just in case." Somehow I forgot to have this discussion with my doctor this year. Guess it's time to create a recurring task in my calendar so I don't forget next year! I know that taking supplements to get my Vitamin D level back into the normal range had made a HUGE impact on my immune system. Not only have I avoided more colds and flus, when I do get sick, my symptoms are much less severe. A rheumatologist first tested my Vitamin D level back in 2005 and discovered it was low, but I didn't begin to treat it in earnest until a few years later when the test was repeated. I am sure that rheumatologist tested me because there is a link between low Vitamin D levels and pain. You can read more about Vitamin D supplements reduce pain in fibromyalgia sufferers at Science Daily. I wish I could tell you that taking Vitamin D has helped my fibromyalgia pain. It has not. But I am pleased that I don't get sick as often and as badly as I did before. Based on my experience, I'd suggest you ask your doctor to check your Vitamin D level too. I hope you have found these tips helpful. To learn more about what you can do about the flu, check out CDC Says “Take 3” Actions To Fight The Flu . DISCLAIMER: This post is intended to convey general health information and is not a substitute for professional medical advice. Please consult your health care provider to make sure these tips are right for you. Good advice Selena! I always get a flu shot because of my compromised immune system, but I can't say the rest of my family does. Last year I tricked the Hubby into getting one! He took me to Walgreen's to get mine, and when he wasn;t looking I paid for two shots, so he was forced into it. How is your pup dealing with his Addison's? Hope you all are well!